The UN-brokered Libya Dialogue which was expected to meet in Tunis today, Wednesday, has now been postponed until Sunday. It is the second time in a week the meeting has been put off. 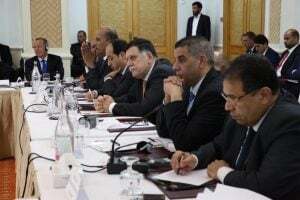 The group had intended to meet last week in Ghadames but that did not happen – mainly because of the Presidency Council and others were opposed to the Dialogue team discussing and possibly approving changes to the Libyan Political Agreement (LPA). In the event, it was proposed that the meeting take place today and tomorrow. However, it appears that the opposition did not calm. Demands for a delay have continued. The latest Dialogue proposals centre round the concept of a three-man Presidency Council (PC), rather than the current nine-man one. While this has broad support within the House of Representatives – one for each of Libya’s three traditional regions – there are deep divisions in Tripolitania over who should represent it. Western Libyans, especially those from Misrata and Zintan, fear a future member could be unsympathetic towards their needs. Meanwhile, the latest track of the Libya Dialogue process, the reconciliation group, has flown to Malta today to start discussions, It is expected meet until Friday. The group first met last September in Tunis, with 100 Libyan officials and experts invited although only 60 turned up. Of these 15 were selected for the track , to which a further 15 were added, These come from all areas of life in Libya. A member of the Constitutional Drafting Assembly, Abdelgader Gadura, is among the attendees. Among the various recommendations they will be discussing is a Truth and Reconciliation Commission, similar to that set up in South Africa following the end of apartheid rule there. Another they are expected to look into will be how to deal with those who have been arbitrarily detained and how such people can apply for compensation. Reforms to the prison system are also expected to be examined.